Since joining JCVI in 2003, Indresh and his team have won several awards for their innovative use of Java platform technology in a genomics environment. Previously, at Celera Genomics, Indresh developed a LIMS for genomics and proteomics applications. 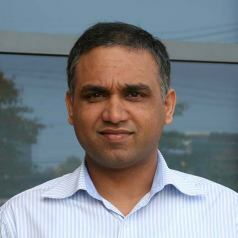 Indresh earned his MS in Computer Science and Engineering from Johns Hopkins University. Software architecture, Software design, Large scale high performance compute infrastructure. Ontology based metadata tracking and data management. Development of data analysis tools and pipelines for genome analysis. Machine learning, annotation, database development, data mining, web technologies and statistical analysis. Standardized metadata for human pathogen/vector genomic sequences. PloS one. 2014-01-01; 9.6: e99979. Structure, function and diversity of the healthy human microbiome. Comparative genomics of the pathogenic ciliate Ichthyophthirius multifiliis, its free-living relatives and a host species provide insights into adoption of a parasitic lifestyle and prospects for disease control. Genome biology. 2011-10-17; 12.10: R100.